NOW Enrolling for ALL Summer Programs! The development of literacy skills—including reading, writing, and comprehension—are critical to a child’s future success, both in school and in life. 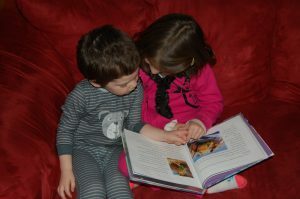 According to a joint position statement of the International Literacy Association and the NAEYC— “Although reading and writing abilities continue to develop throughout the lifespan, the early childhood years—from birth through age eight—are the most important period for literacy development.” Providing children with high-quality language and literacy experiences at a young age will not only encourage a love for reading, it could also greatly enhance early development. Read on to learn how you can help your child find the path to success. Read daily. Set a regular time and a quiet place. Turn off distractions and cuddle up with your favorite book. Name everything. All people, places, and things have names. Use them every chance you get. Read everything. Words are everywhere. Point them out on street signs, menus, billboards, labels, etc. Be positive. Talk about how much you enjoy reading together. Have fun! Use funny voices, act out the story, be enthusiastic. The kids will join you. Don’t force it. If he has his mind set against it or is having trouble paying attention, let it be for a while and try again later. Encourage interaction. Ask her questions, point things out, answer her questions. Read it again. The repetition of reading the same story, again and again, will help build language skills. Click here to learn Why Reading the Same Book Repeatedly Is Good for Kids (Even If It Drives You Nuts). Visit the library. Your local children’s library can expose your child to a whole new world of literature. Click here to learn 5 Good Reasons to Take Your Kids to the Library Today. Set a good example. Let them see you reading. If you don’t enjoy books—newspapers or magazines are just as effective. Family reading times. Get together as a family and take turns reading to each other. Play silly word games. Rhyming, poems, and silly songs can help children learn the patterns and rhythm of language. Tell stories about life. Practice language skills by talking about your day and telling stories about past events. Remember, it’s never too early to start! Visit us on Pinterest for more tips on Raising Readers! Categories: Tips for Parents. Bookmark this Event. Copyright © 2019 Learning Tree Academy.